Importance Ratings are scored by Managers and Self-raters in order to evaluate the significance of specific competencies in the target’s role. The importance items appear the same as other rated items in the review, but are scored using the Importance Ratings scale. These ratings may help targets realize development opportunities in their current role. 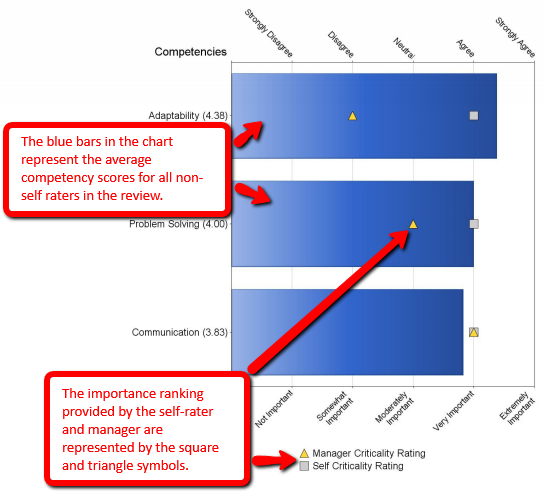 The blue bars in the chart represent the average competency scores for all non-self raters in the review. The importance ranking provided by the self-rater and manager are represented by the square and triangle symbols. The blue bars are the overall score for the competency and should match the scores in the competency summary/profile sections of the report.